Hot tub shock is a valuable tool in your arsenal for keeping your water chemically balanced and safe to enjoy, if used properly. It's called a shock because it literally rips the electrons off harmful particles in the water, leaving them susceptible to being destroyed quite quickly. It can clear up a cloudy and stale smelling hot tub in minutes but there are also negative side effects if it not used properly. The oxidation process that takes place when you shock your hot tub is the same as shocking a pool but you should not use a pool shock in your hot tub or vice versa. The dosing is very important when it comes to achieving the desired results, it takes a very small amount of shock to under or over shock your hot tub. A hot tub shock should be viewed as a back up or ace in your sleeve when your sanitizer gets overwhelmed. 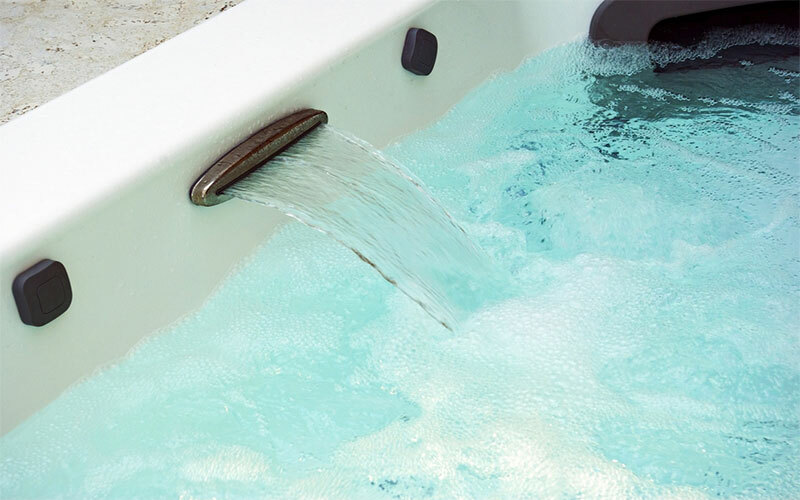 A hot tub that is balanced properly should be able to handle a moderate bather load with diligent testing and a proper hot tub maintenance schedule. There is no harm in shocking more often but it's just not as necessary as you might think. There are instances where a shock can be very valuable and for this reason you should always keep a good supply of hot tub shock on hand. We've simplified it into 3 distinct reasons to break out the shock. Chloramines and bromamines are the residuals left behind after chlorine and bromine have attached to an invasive molecule in your water. You don't want them in this state because they smell, cloud the water and they don't have any sanitizing power. Test your combined chlorine or bromine levels using a DPD test kit and add at least 10x the shocking oxidizer to zap these molecules. Learn more about testing hot tub water below. The term organic contaminants is a nice way of referring to sweat, urine, dead skin and anything else that a person brings with them into the water. The hot tub sanitizer can handle a moderate level of organics but when you get a high bather load, the sanitizer can fall behind. This is where a hot tub shock comes in really handy to give the sanitizer a boost to get back on track. Bacteria isn't good anywhere and you definitely don't want it colonizing in your hot tub water. Chlorine and bromine do a really good job at killing bacteria but unfortunately when sanitizer levels drop, you can get growth that can only be killed by shocking. You should also drain the hot tub and refill with fresh water after shocking and cleaning thoroughly if you experience a rash caused by folliculitis. There are 2 types of hot tub shock, chlorine and non-chlorine shock and they are very different. There is no best shock that is ideal for all situations but each one is very good for specific circumstances that we'll go over. A chlorine granular shock is comprised mainly of chlorine in high concentration. It works by spiking the chlorine hard and fast. It is ideal for killing bacteria, after heavy usage and after refilling your hot tub to give the chlorine sanitizer a head start. It is not recommended as part of your weekly or bi-weekly maintenance routine because it can be hard on plumbing. You may also have to wait hours before levels drop down so you can safely use the hot tub again. It can be used with both chlorine and bromine sanitizers. A non-chlorine shock oxidizer will prevent organic build up and clear up cloudy water. It can be used as part of your weekly or bi-weekly routine because it's not as harsh as chlorine shock. It's important to recognize that a non-chlorine shock will not kill bacteria but it will get your free chlorine or bromine back on track and working more effectively. It's time to go over how to shock a hot tub and if this is your first time, be sure to read through the instructions before starting. It's a simple procedure and it's most effective when done correctly. Keep safety in mind and always wear splash protection goggles and chemical resistant gloves when handling chemicals. Children and pets should be kept away any time you are handling chemicals. Test your hot tub water before adding the shock. A balanced hot tub will be way more receptive to a shock and exponentially more effective. Ensure that the pH is between 7.2 and 7.6 because oxidizers work more effectively in a low pH environment. The hot tub cover should be removed and kept off for at least 30 minutes after adding the shock. This allows aeration and while the chemical reactions take place in the water. You want the water to be calm and not agitated but you do want circulation happening. This can be achieved by keeping the jets and circulation system running with the air turned off. Now that you have prepared the hot tub be shocked it's time to get down to business. Always read the label before starting to identify any specific handling instructions. Chemicals can be extremely dangerous especially if they are purchased in concentrated form. How long to wait after using a hot tub shock? This question gets asked a lot and the easiest way to know is to test the water. Since a chlorine shock spikes the chlorine, you need to make sure that the chlorine levels have dropped down below about 5 ppm. The amount of time it takes will vary on the size of your tub and how much shock you used, it can take between 15 minutes and several hours for a chlorine shock. If you used a non-chlorine hot tub shock you won't have to wait very long after shocking to use your hot tube because it doesn't actually sanitize the water. It should be a 15-20 minute wait but always read the label on the shock manufacturers packaging for safety recommendations. The fastest way to test the chlorine in your hot tub is to use a chlorine test strip. You will get an instant result so you will know with confidence that its safe to enjoy your hot tub again. You of course always have the option of taking a sample of the water to a local pool or hot tub store. They will often provide accurate results the same day or next day. Test strips are fast and convenient and are priced affordably. There really is no downside to them other than they don't provide precise readings. You can dip test strips directly into the hot tub but we recommend you retrieve a water sample by dipping a clean, empty cup upside down until your elbow is under water, turn the cup over and bring the water sample straight up. This procedure ensures that you are getting a sample from a middle area of your hot tub. The theory behind it is that you will be getting a more accurate reading of the overall chemistry of your tub. You can then dip the strip into the cup, wait 30 seconds and compare the color on the strip to the color swatch on the container. A test kit will consist of liquid reagents and a tester that is used to retrieve water the same was as explained above. After the water sample is obtained, you add reagents to the tubes as per the instructions and mix the solution. The color can be easily compared on the tube to determine the level you are testing for. A complete pool or hot tub test kit is something that every hot tub or pool owner should have on hand. It may take a bit of time to learn how to use the testing equipment but it becomes second nature after a few times. You simply not possible to test too often and it's nice to know that a hot tub shock or a bit of chlorine can solve a problem in a pinch if you know what is going on in your hot tub water. We hope that you found this page about hot tub shock informative and easy to follow. It should help you get back to enjoying your hot tub in no time!